Do you want to reclaim “link juice” and improve user experience? Then it’s time to find and fix your site’s broken links and broken backlinks. Doing this will almost certainly have a positive impact on your rankings. But it’s important to note that broken links and backlinks are two entirely different problems. 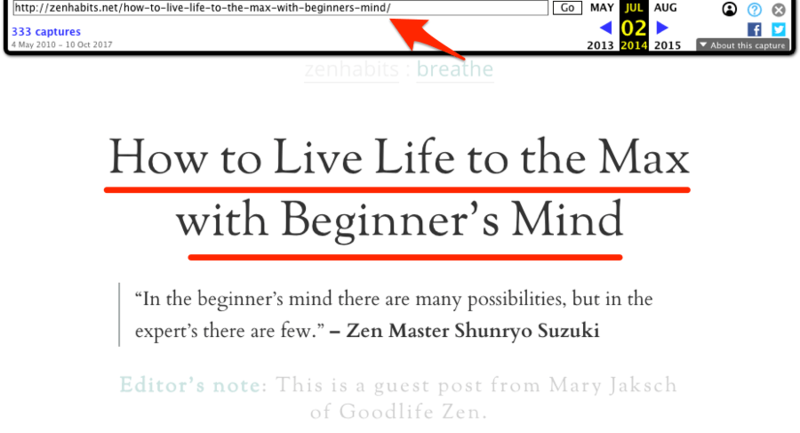 How to find and fix broken links (i.e., broken links on your site). 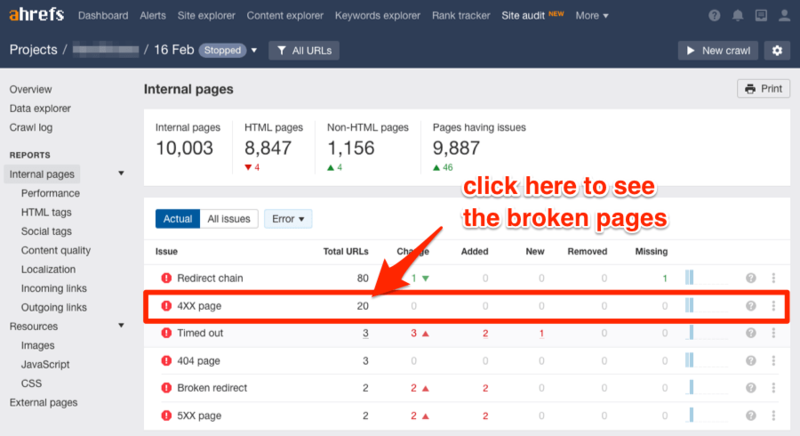 How to find and fix broken backlinks (i.e., broken inbound links to your site). Both of these fixes will help to reclaim so‐called “link juice” across your site and improve user experience. IMPORTANT! 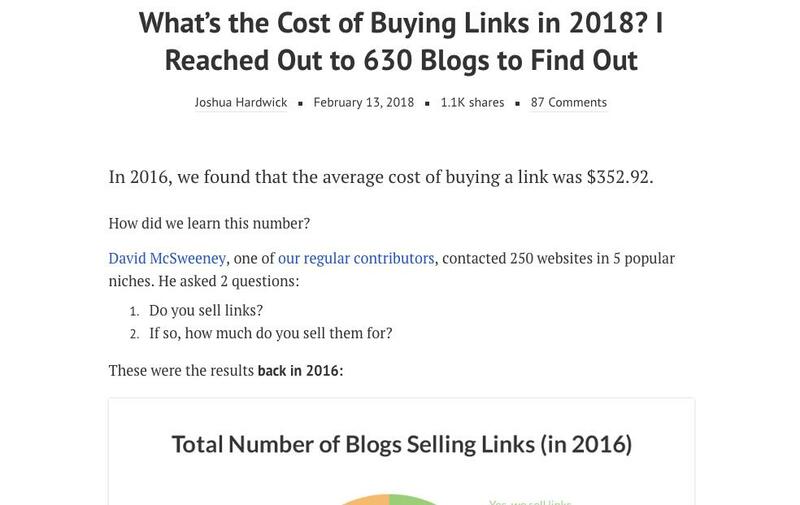 This post is NOT about the so‐called “broken link building” strategy, which involves exploiting your competitors’ broken backlinks to build new links to your site. If you wish to learn more about this strategy, check out our full guide to broken link building. Some people say that broken outgoing links (both internal and external) effectively waste “link juice”—this is due to the way Google’s PageRank algorithm works. Some people also say that they hinder your websites crawlability. But technicalities aside, one thing is for sure: broken outgoing links (both internal and external) lead to a poor user experience. You should, therefore, make every effort to fix them—it’s easy, I promise! For small websites, you can use Site Explorer to find all broken external links. Site Explorer -> yourdomain.com -> Outgoing links -> Broken links. You can view this report for any site, it doesn’t have to be a site that you own. Check out our guide to broken link building to see how this can be used to build new backlinks to your site. But for larger websites, it’s better to use Site Audit; this will perform a live crawl of your website and thus, will ensure that you don’t miss any broken links. Site Audit -> Project -> External Pages -> HTTP status codes -> 4XX. You will need Site Audit for this, too. Site Audit -> Project -> Internal Pages -> HTTP status codes -> 4XX. 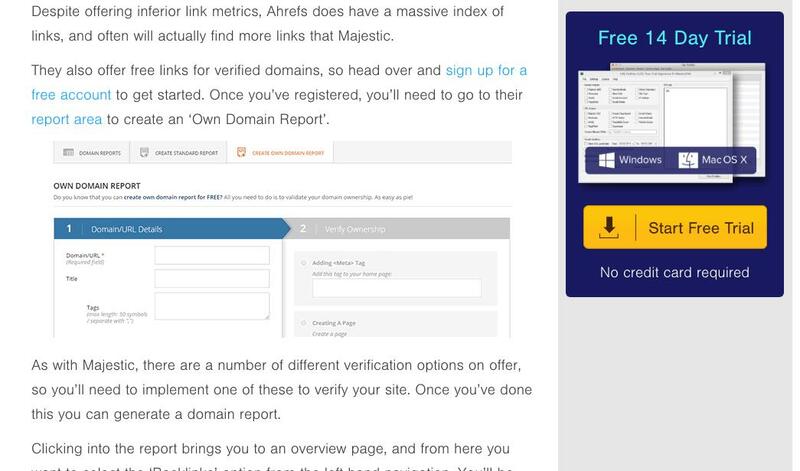 Ahrefs isn’t the only tool you can use to find broken links on your site. You can also check the crawl errors in Google Search Console, use crawling tools like Xenu’s Link Sleuth and Screaming Frog SEO Spider, or if WordPress powers your website, you can install a Broken Link Checker plugin. In all honesty, this is quite an easy task—it’s just super‐boring! Remove the links: Again, this can be time‐consuming if you have a lot of broken links, but the process is straightforward—locate the link in the content, then just remove it. As I said, this is a pretty mundane task, so it may be worth hiring a VA to do this for you. They are ten a penny on UpWork. Broken backlinks are broken inbound links from other websites to your site. Because the page on our site no longer exists, it returns a 404 error. Want to see an example of the latter? The closing bracket is included before the closing </a> tag—this is wrong! It’s an easy mistake (that was no fault of our own), but it still results in a 404. It just sort of evaporates—or perhaps, spills—when it hits the 404. Google has said that they don’t have any kind of authority score metric based on the overall backlink profile of a given domain. Therefore, these links (as they are) provide no benefit for you. It is true that broken links still contribute to your Domain Rating (DR). But remember, this is an Ahrefs metric that merely shows the strength of a target website’s total backlink profile (regarding its size and quality)—that’s all! For this, I’ll use Ahrefs’ Broken Link Checker. 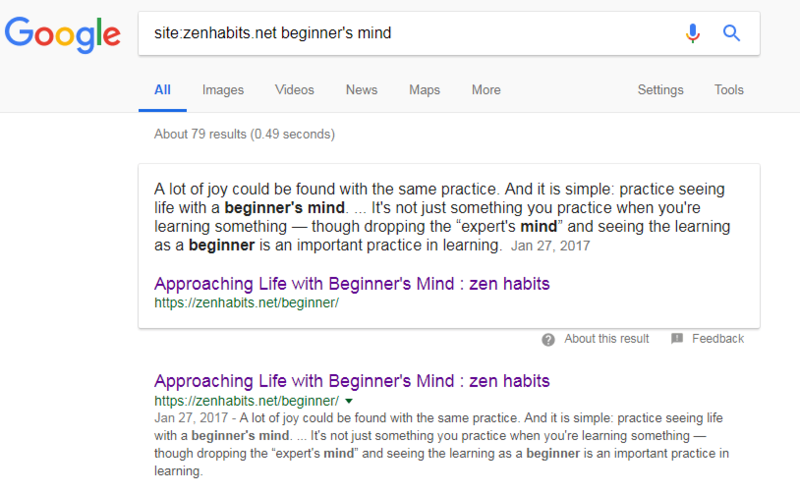 Let me show you some examples using one of my favorite websites, zenhabits.net. Site Explorer -> yourdomain.com -> Pages -> Best by Links -> add a “404 not found” HTTP response filter. 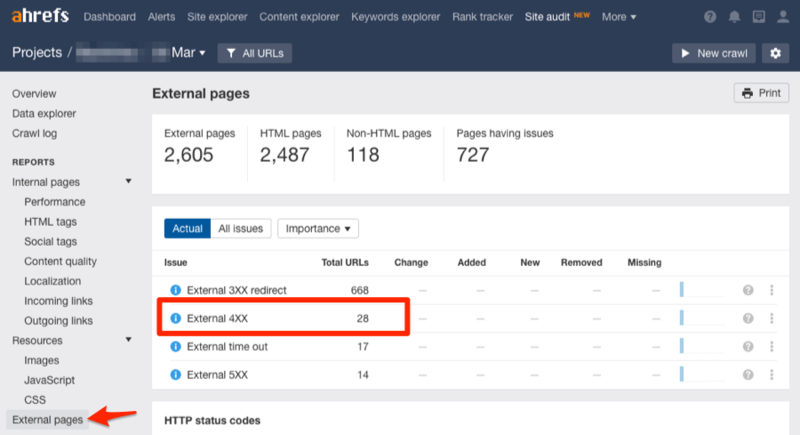 This report lets you quickly sort all the URLs that return a 404 code on your site by their URL Rating (UR), number of backlinks, or ref. domains count. By default, these links are ordered by URL Rating (UR). Personally, I prefer sorting by the number of linking domains (i.e., RDs)—this way, we’re starting with the URLs that have the most broken links pointing to them. 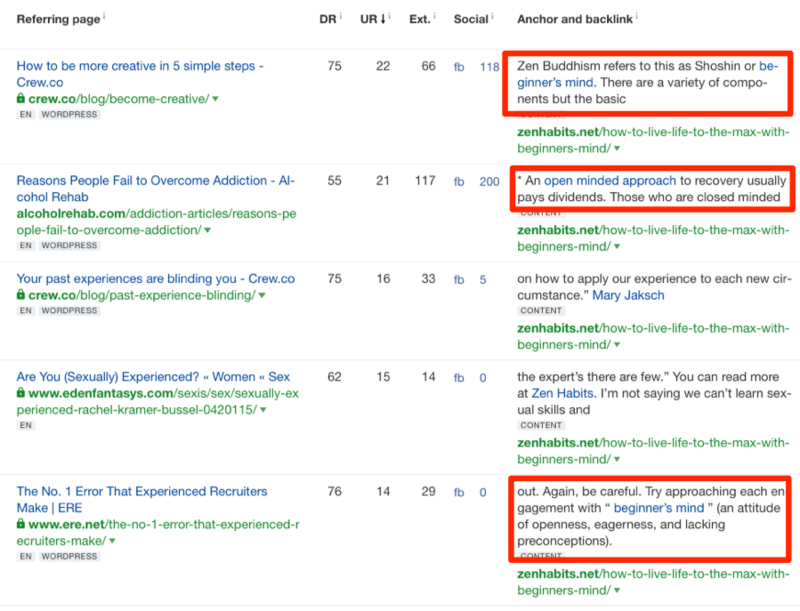 Do that for zenhabits.com, and you’ll see that one of the broken pages has 80 referring domains! 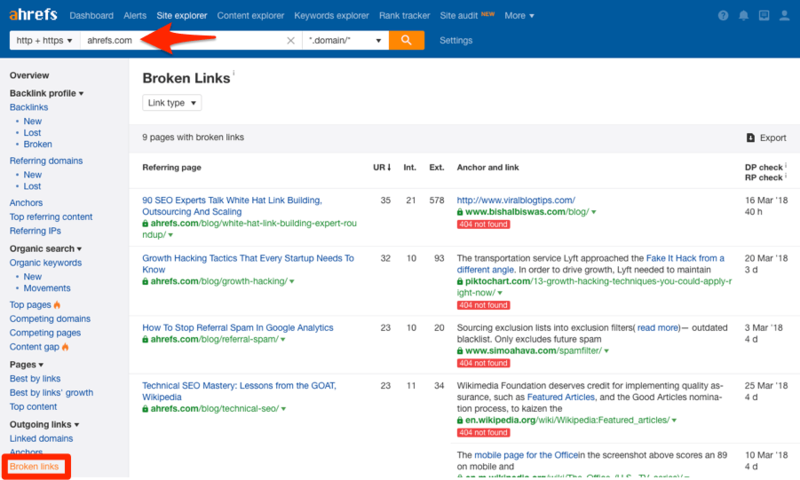 If you’re already familiar with Ahrefs, you may be aware that we have a dedicated Broken backlinks report in Site Explorer. 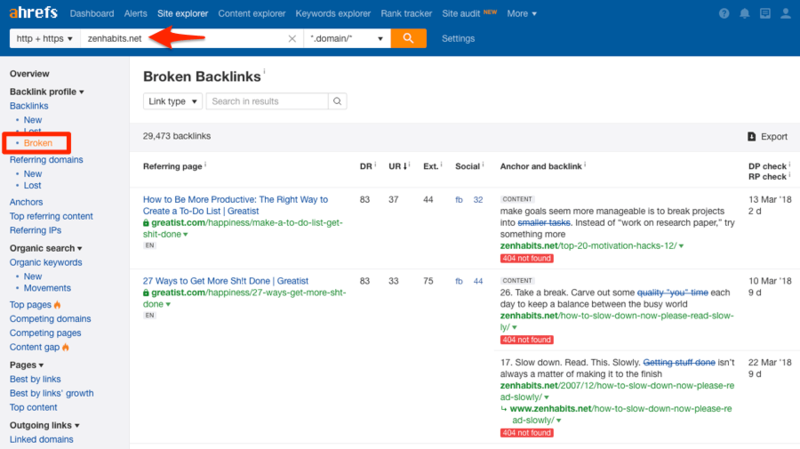 This report is useful if you’d like to prioritize your broken backlinks by the Domain Rating (DR) or the URL Rating (UR) of the referring page. It goes without saying that you have no control over the links outside your website. Reach out to the linking website and request a fix: If the linking website made a mistake when linking to you (as was the case with the incorrectly formatted Site Explorer link above), it’s worth reaching out and letting them know about the issue. They may fix it. Redirect (301) the broken page to the new location: Sometimes you may change the URL of a page and forget to redirect. This is an easy fix—just find the new page location and implement the redirect. Recreate and replace the content at the broken URL: Find out what the broken page used to be and replace or recreate it. But which solution should you use? Well, I recommend going through these in the order that they’re listed. By that, I mean that if option #1 (i.e., reaching out and requesting a fix) isn’t appropriate, move on to option #2, then #3, and so forth. Looking at the URL, it’s clear that there are no formatting issues (option #1). So there’s no need to reach out to anyone as the mistake is on our end, not theirs. So let’s move on, and try to figure out what this page was before it was moved/removed. In this instance, we can get a rough sense of what this page was about by looking at the URL. But it doesn’t give us the full picture. So let’s use the Wayback Machine to see an archived copy of this page. 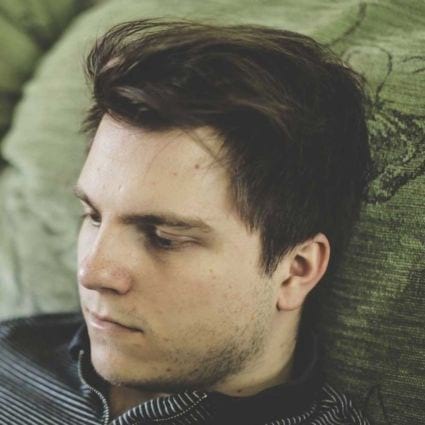 It looks like the article was about the “beginner’s mind” attitude to life. You’ll sometimes find that The Wayback Machine hasn’t archived the desired page. No worries; Ahrefs to the rescue. Site Explorer -> enter the broken URL -> Backlinks. Now, look at the anchor text and surrounding text for each link. This will almost always give some insight into what the page was about. If you’re still unsure, try reading some of the articles that link to the broken page—these can often provide even more context. Now that we know what the page was, the first step is to check whether the page was deleted or moved. To do this, search in Google for: site:yourdomain.com + "title of the page"
If this search finds the broken page (at a different URL), then you can simply redirect the old, dead page to the new URL using a 301 redirect. 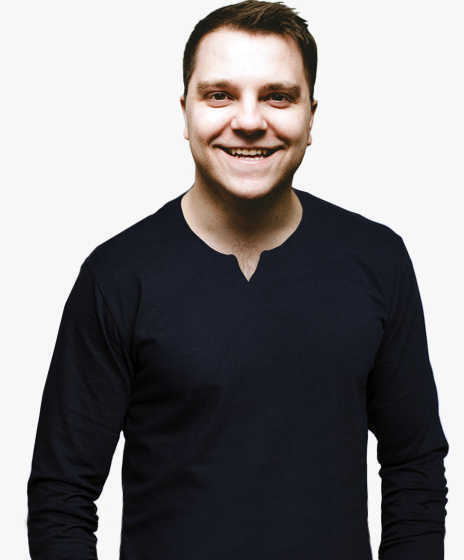 As announced by Gary Illyes from Google, 301 redirects do pass PageRank. But if no results are found (as is the case here), then chances are that page was deleted. At this point, if you simply wanted to replace or recreate the page, you could—this would fix all broken links as the URL would no longer lead to a missing page. However, nine times out of ten, you will have deleted the page for a reason, so you probably won’t want to do this. Thus, the next step is to check to see if you have any similar content on the site, then redirect. If I managed this website, I could set up a 301 redirect from the old, broken page to point the other 80 referring domains to the live page. 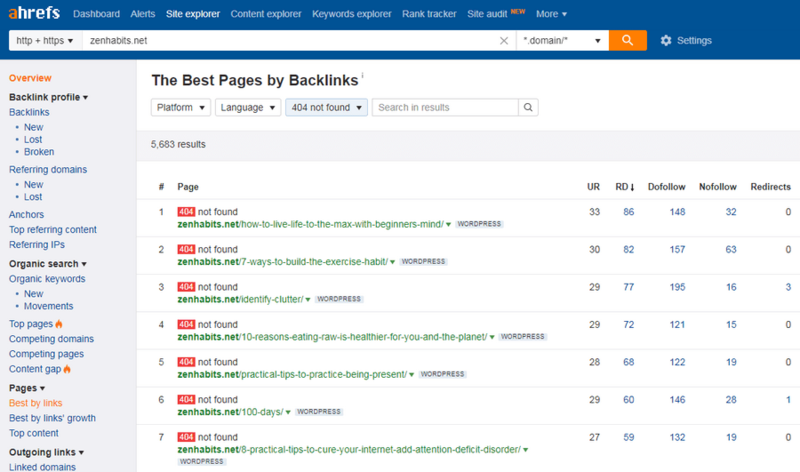 You should only redirect broken backlinks to relevant and similar content: Broken backlinks naturally have specific anchor text and surrounding text. Make sure your redirects would not confuse, Google because anchor text matters! Redirecting broken backlinks to the homepage might not be the best idea: Even if we forget Google for a moment, think about your visitors. They expect to see some specific content when they click a link to your website; they don’t expect to see your homepage! But what if there is nothing relevant to which you can redirect the broken page? What then? To be honest, sometimes it’s perfectly fine to ignore the broken backlink; just make sure it shows an informative 404 page. And never use “soft” 404s. A soft 404 is when a web server returns a response code other than 404 (or 410) for a URL that doesn’t exist. A common example is when a site owner wants to return a pretty 404 page with helpful information for his users, and thinks that in order to serve content to users he has to return a 200 response code. Not so! You can return a 404 response code while serving whatever content you want. […] Keep in mind that just because a page says “404 Not Found,” doesn’t mean it’s actually returning a 404 HTTP response code—use the Fetch as Googlebot feature in Webmaster Tools to double‐check. Google also classes the bulk redirection of any unknown or broken pages to your homepage as undesirable “soft” 404’s, so this is yet another reason to avoid doing this. Broken links and backlinks not only waste “link equity,” but also contribute to a poor user experience. That’s why you should make every effort to find and fix them. But this isn’t a one‐time task; detecting and fixing broken links and backlinks must be an ongoing process, as a part of your sites’ regular SEO Audits. What’s your experience with fixing broken links and backlinks?